The Architecture of Patterns - Description | W. W. Norton & Company Ltd. Through a precise and expansive definition of what a pattern is, this book offers ways to understand and use patterns in contemporary design. From the structure of the universe to the print on your grandmother’s couch, patterns are found in a variety of concrete and conceptual phenomena. For architecture, something that so easily traffics between science and taste demands attention, which partially explains patterns’ recent revival across diverse stylistic and intellectual camps. Yet, despite their ubiquity, their resurgence remains un-theorized and their capabilities underutilized. To date no account has been given for their recent proliferation, nor have their various formal and functional capacities been examined. In fact, the relationship between patterns and architecture hasn’t been addressed in almost 30 years. 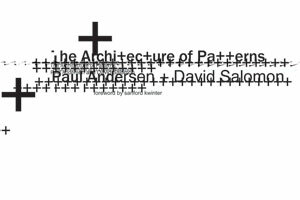 This book fills that gap by tracking the definitions and applications of patterns in a number of fields, and by suggesting how contemporary patterns might be used in design. Drawing on historical material and recent case studies, it gives shape to patterns’ emerging potential. The Architecture of Patterns provides an updated definition of patterns that is at once precise and expansive—one that allows their sensory, ephemeral, and iterative traits to be taken as seriously as their functional, everlasting, and essential ones. Book design by David Carson. Foreword by Sanford Kwinter. Projects by Atelier Manferdini, Bjarke Ingels Group, Ciro Najle, EMERGENT/Thomas Wiscombe, Foreign Office Architects, Jason Payne and Heather Roberge, Herzog and de Meuron, J. Mayer H. Architects, Reiser+Umemoto, Responsive Systems Group, and !ndie architecture.